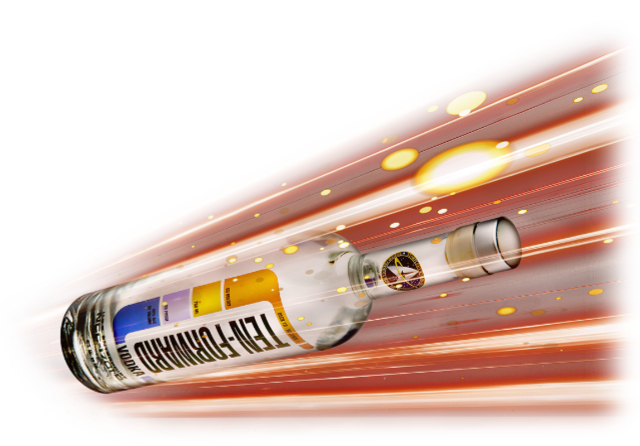 Booze, the final frontier. This is the marketing death of a childhood memory you prize. Yeah, there's Star Trek-themed vodka to be had. According to io9, CBS and the Silver Screen Bottling Company, have plopped out a Star Trek: The Next Generation-themed line of hooch to help you drink away the fact that the future, despite what Star Trek might have had to say about it, is twelve kinds of terrible. Aside from featuring an LCARS-influenced bottle design (that’s the Enterprise’s computer operating system from TNG onwards), the vodka’s Star Trek-iness is enhanced by the fact that... it’s been to space? No, really: the company is planning to send a batch of the spirit into space, which will be blended with the larger stock to guarantee that at least every bottle contains a tiny bit of space-bound booze. I’m sure the discerning Star Trek fan will absolutely be able to notice this cosmic addition while they down shot after shot during their next Trek marathon. Ten Forward Vodka. It's clever, I'll admit. But I dunno. I love Star Trek and I applaud healthy fandom. But outside of the novelty of drinking space hooch, or perhaps buying this for a Trekkie pal's birthday, I don't see how this product could be any more niche. What do you guys think? Now, if someone were to figure out Chief O'Brien's scotch-flavored chewing gum from Deep Space Nine? I'd be all over that.